Please read these instructions through to the end before you begin this organizing project. You might want to take a before picture of the cluttered mug shelf and the counter below it before beginning. Give yourself at least an hour for this project. It will take more time than that for several large shelves of mugs or if the counter top is cluttered. Clear at least the front two thirds of the counter directly under the cabinets where the mugs are stored. If the space is too small, use a different counter, a kitchen table or TV tables. Gather all the mugs from other rooms and the dishwasher. Make sure they are clean and dry. Make space for the following five categories and place a post-it label in each space. 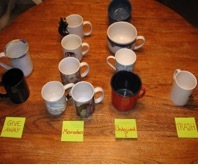 Remove mugs from the cabinet one at a time and put each mug in one of the five categories. Do this until all the mugs are categorized. 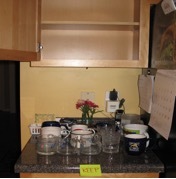 If there are items on the shelf other than mugs, put these items with other like items. Now that the shelf is empty, take a damp sponge and thoroughly wipe down the cabinet including the top, sides and door. Wipe and return the current liner or install new shelf liner. 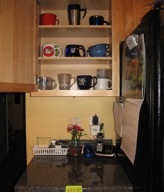 Place the mugs from the keep category back into the cabinet, with the least-used mugs in the back of the shelf. Place the mugs you don’t want to keep in the give-away box. Place broken, cracked or chipped mugs in the trash. Place mugs that have sentimental value but are never used in the memento space. Focus on the undecided group. First, determine the space available and how many mugs it will hold. Now, decide how many mugs in the undecided category to keep or give away. If you have more mugs than will fit in the space available, either let go of more mugs, clear more shelf space or do a combination of both. When all the mugs you want to keep are neatly on the shelf with the ones used most in the front and the ones used less frequently in the back, this part of the process is complete. You can take an after picture at this point. Take another look at the memento mugs. Do you still want to keep all of them? If so, decide how to re-purpose them. Will they be pencil holders, display items, planters or do you want to re-gift them? Put the give-away box in your car. As soon as possible take it to the place where you want to donate the unwanted mugs. If this process has not led to a satisfactory conclusion, ask for help and go at it again. Ask a friend or family member for help going through the process, or call a Professional Organizing Consultant.